Hello ! 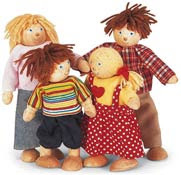 Welcome to the family : Jenny Woodenmum, Mr Woodenmum, Jessica and Johnny ! For our official blog, please visit the John Crane Blog. That was our official home but now we're living with Sophie and Juliette in the Madhouse ! If you'd like to adopt some of our brothers and sisters (and maybe let them start their own blog too), you can find them here.